The coming together of Amrapali group and O2 grouphas crafted a 100 acre township located at, next to Pari Chowk. The Hemisphere Villas, Greater Noida, rightfully called so, is a self-sufficient space with 80% open space, embellished with the picturesque landscape. 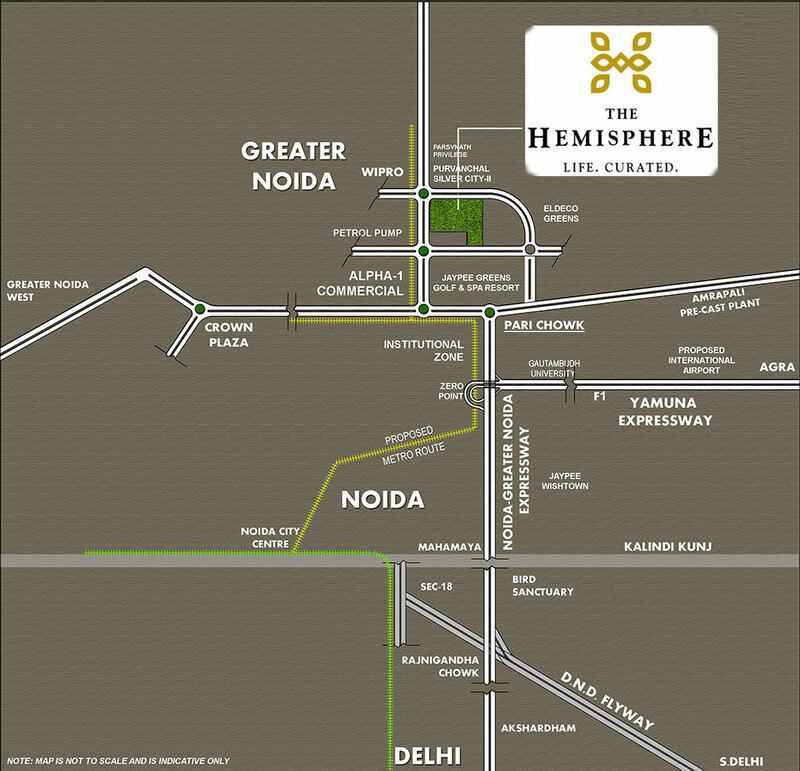 The site is located next to the Yamuna Expressway and the upcoming FNG expressway, as well as Greater Noida Expressway. The metro line is also planned nearby, so commuting is smooth. The lavish resort-like ambience contains top-line amenities for an active and relaxed lifestyle. There is a superb golf club, swimming pool & tennis courts, indoor games, clubhouse, wellness center, community hall, banquet hall, outdoor games areas, multi-purpose play fields and meditation/yoga spaces. Unique rock-climbing and commando training, mini-jungle gym, amphitheater and a garden with orchards next to a water fountain are additional pleasantries here. The Hemisphere homes are stylized as villas is beyond words! Modern plushness personified, these are 3, 4 and 5 bedroom villas built over plots of sizes 100-400 sq. yards. There are spacious villas with openness and classy finish – modular kitchen, fully equipped with a chimney and hob and posh bathrooms, amongst others. Each villa lends lovely views of the pleasant greens for a relaxed and ready appointment with nature. There are green installations such as rainwater harvesting and an earthquake-resistant framework. With security cover all the time, and 24*7 power backup and water supply, the place is a happy and healthy community. The Hemisphere Price starts at just Rs. 1.080 Crs, unbeatable, just as its features! Located at Pari Chowk, Greater Noida. 25 min drive to Kalindi Kunj(Delhi).